Tottenham hope for a win at the Britannia Stadium to stand a chance of closing in on Leicester when the face Stoke City at the Britannia Stadium on Monday night! Check out here our STOKE CITY v TOTTENHAM betting preview with expertpredictions, betting tips, enhanced odds, starting line-ups, betting promotions and no deposit free bets on the Monday Night Football! Stoke City, who comfortably sit ninth in the Premier League table, disappointed in succumbing to a 4-1 defeat to Liverpool last weekend. Prior to that, they were held to a 2-2 draw by Swansea on April 2. A record of 13 wins, eight draws and 12 defeats has brought the Potters 47 points and they are currently just three points behind seventh-placed Southampton. Mark Hughes will be without the suspended Erik Pieters while his likely replacement, Marc Muniesa, is an injury doubt having not trained before Friday due to a knock. Marko Arnautovic has trained this week though and should be fit to return to the XI, while skipper Glenn Whelan is still struggling with a back problem. Jack Butland, Glen Johnson, Jonathan Walters and Marc Wilson all miss out through injury for the Potters. After Leicester drew against West Ham on Sunday, Tottenham are currently eight points behind the leaders, but that would become 5 (with 4 games to play) if Spurs manage to win at the Britannia. Since losing 1-0 at West Ham on March 2, Spurs have gone unbeaten in the Premier League and they will enterthis clash off the back of an impressive 3-0 victory over Man UTD last weekend. Pochettino's men boast the best defensive record in the league this season having only conceded 25 goals, they also have the best attack - having scored 60 goals in their 33 matches. Mauricio Pochettino could name the same starting XI that beat the Red Devils last time out. Jan Vertonghen returned to the starting XI in place of Kevin Wimmer last weekend following a knee injury and will be expected to start alongside Toby Alderweireld. Kyle Walker and Danny Rose, meanwhile, will continue in the two full-back areas ahead of Ben Davies and Kieran Trippier. Christian Eriksen, Dele Alli and Erik Lamela are expected to form the attacking midfield trio behind Harry Kane. Clinton N’Jie (knee) is unlikely to feature and Nabil Bentaleb remains out. Stoke held Tottenham to a 2-2 draw at White Hart Lane when the clubs last met in August and the Potters are now W2-D1 through their last three encounters with Mauricio Pochettino’s team. There have been seven red cards in the last seven Premier League games between the two teams at the Britannia Stadium. Enhanced Odds! 6/1 Spurs to to win + £100 bonus! Risk-free! Price boost! 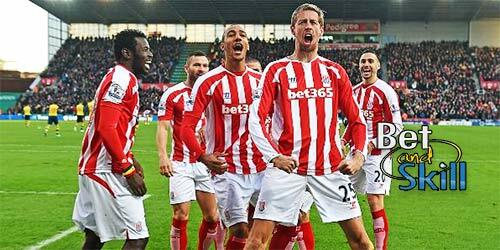 Get 6/1 Tottenham to beat Stoke City! Crazy price! Get 3/1 Leicester to win the the Premier League! RealDealBet just launched in UK! Get a £100 welcome bonus! Bet £5, get £20 at BetStars! Try the new "Spin & bet" feature! New betting bonus: get up to £50 in free bets! New bookmaker: up to £50 bonus for new customers! £200 in free bets for new customers! Get a £30 risk-free bet at Betbright! New 400% bonus: bet £20, get £80 free bets! €5 no deposit + £100 welcome bonus (UK customers not accepted yet)! "Stoke v Tottenham predictions, betting tips, lineups and odds (Premier League - 18.4.2016)"